I have always wanted a coat rack to have by our front door. I have been looking for one for a few years and either can't find the design I like or can't afford the one I do like. Recently, I asked my Mom if she knew where to find a good coat rack. She was excited to tell me that she had one she no longer needed or wanted. So, I sent Zach out to get it not knowing what to expect. When he returned I was pleasantly surprised to see a "just the right size" coat rack. There was only one problem with the coat rack; it was plain wood. Yes, I know that plain wood is great, however, any one that knows me well knows that plain wood doesn't last long in my house. 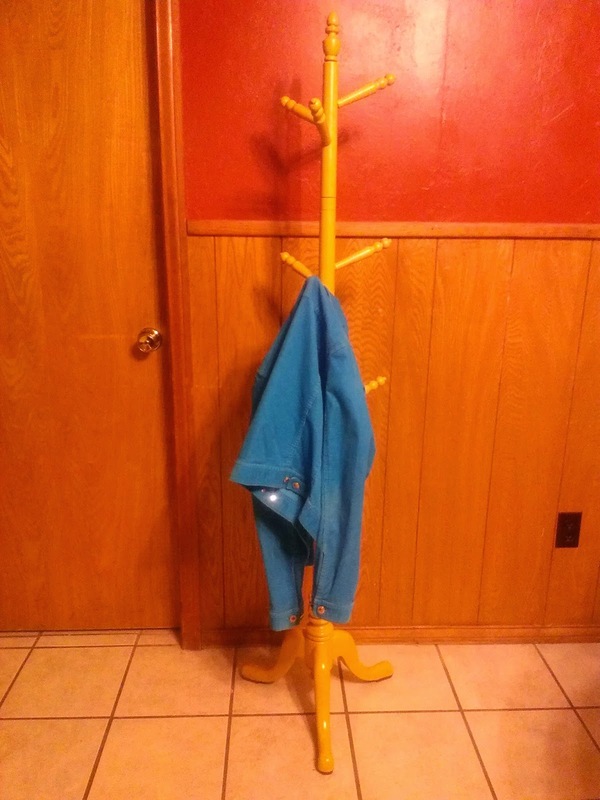 This plain wood coat rack lasted longer than most because of several unexpected events; including my wreck that totaled our van. Needless to say the coat rack took a low priority. Finally, this week my attention drifted back to the skinny plain friend in the entrance hall. My first thought was my favorite color turquoise. After all, I love turquoise and I have painted many pictures frames, chairs, and stuff that special color. However, after much thought I decided upon "Golden Sunflower". I was so excited and went to Walmart to buy some paint. I usually will look at the discount paints first, but not this time. I wanted that PERFECT color and it had to be "Golden Sunflower". Now, it has been several years since I have bought brand new paint in a can. I was thinking of buying a whole gallon to have on hand for other things. I marched right up to the counter and told the nice lady I wanted the cheapest semi-gloss they had. She then informed me it was $17 for a gallon! Huh? I was shocked! Now this certain day, I actually had $17 to spend, but I just didn't feel quite right about that. I immediately called Chad, who is also an expert of cutting corners, and asked his advice. He encouraged me to maybe find a similar color in spray paint bringing the cost down to under 4$. So, I told the nice lady that I would be right back. As I looked over the spray cans, my beautiful Sunflower color was no where to be found. My heart sunk. 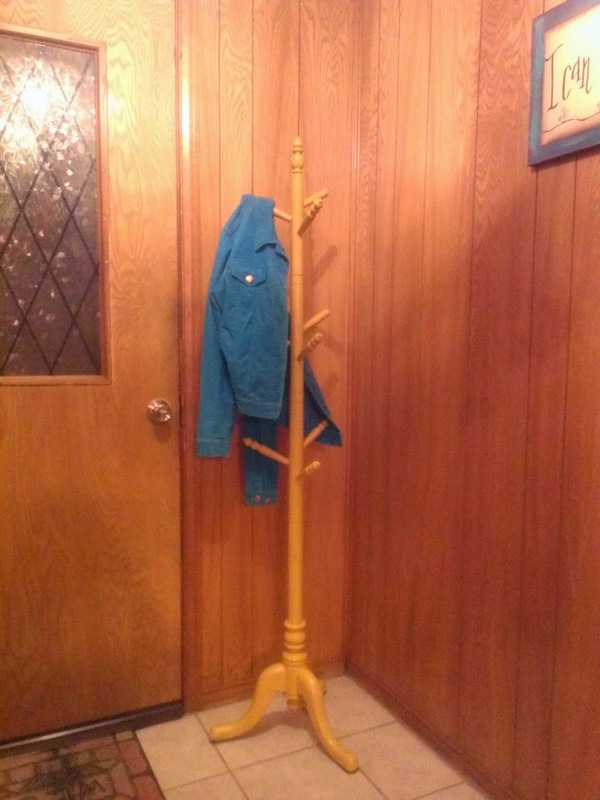 I really wanted my coat rack to be perfect and I was convinced that my color of choice would make it so. Suddenly I remembered something very important. I forgot to pray. Yes, that might sound silly to some, but I talk to God all day long. "Lord, what should I do?" Instantly my mind went to the discount paints. I really wanted the PERFECT color, not someone's mistake! However, I walked over to the back of the paint aisle to look for clearance. There it was, one quart (all that I needed) of perfectly mistaken SUNFLOWER for 5$. I blinked my eyes and laughed. I was reminded of two very important things that day. First, always pray for wisdom no matter how "small" something seems and second, always check clearance first!! !